A new set of goals to remind us what matters most, and put us on track for greatness. What mark do you want to leave on this world? Have you given it much thought? It’s a big question. It’s one I think we all come back to at different stages of our lives, and right now I find myself dwelling on it more deeply. Nine weeks ago, I became a dad. I can’t help but think through this new perspective. What is the future going to look like for our family? For our world? And what will my contribution be towards this future world? It turns out, the world is setting some goals right now too: the Sustainable Development Goals. They are 17 goals that we, the United States, along with the rest of the world have committed to fulfilling by 2030. The first of these goals is that we will end poverty by this date. End, as in totally wipe out, ensuring that no human being lives on a paltry $1.25 a day or less. That’s quite a goal, right? Another one is to end hunger. Not reduce, or halve hunger. Eradicate it. There are also goals to fight climate change and inequality, since we can’t fight poverty without addressing these crucial issues. As a dad now, I’m thinking about what all of these goals will mean for my daughter. She’ll be 15 years old in 2030, becoming more aware of the wider world (hopefully) and her role in shaping it. Okay, maybe she’ll also dealing with that self-centered teenager stuff. I’ll work on it. But imagine this: she could actually live in a time when no one lives in extreme poverty. A world in which not one single person goes to bed hungry every night. When her opportunities will equal those of any boy her age out there. How freakin’ exciting is that?! I remember becoming charged about an earlier set of global goals in college, starting at a U2 concert, ten years ago. I began to learn then of the Millennium Development Goals; eight goals that carried us from 2000 up to this year. In this 15-year timeframe, the world has seen the fastest reduction in poverty in human history. We’ve accomplished some impressive feats together. We also have a long way to go. Setting new even more extensive and ambitious goals is only the start. Yet, what I find so totally exciting is the notion that we can come together to agree and hold ourselves to these goals in the first place. I am one of the people who, inspired by the Millennium Development Goals, decided that I needed to be a part of this global movement. What the heck could be more important than to help save and change lives around the world at this massive scale? I got involved on campus, to activate others, and joined forces with a student from South Sudan to raise funds to build a clean water well in the village where he grew up. That was my personal way of contributing then and it transformed me in powerful ways. It’s why I work at Oxfam America now. And in thinking about how these Sustainable Development Goals intersect with my own personal goals, I’ve come to realize that as we write our individual stories we’re all reaching in some way for that journey to accomplish something great and leave our mark. As ridiculous as it might sound, we possess the power to save the world. We can leave a mark so great that every generation after us will live in a better world as a direct result of our actions. Does that sound crazy? There is reason to be enthusiastic. As world leaders gathered at the UN headquarters in New York City this weekend to adopt this new set of goals, 60,000 people rallied together in Central Park for the Global Citizen festival, fueled by music from some incredible artists and words from inspiring speakers such as Nobel Peace Prize Winner Malala Yousafzai. There is energy behind the idea that we can really do this. I have to believe that we live in a world in which we can accomplish great things: a world in which we will not allow a mother to lose her child to starvation or a father to watch his toddler’s body wash ashore. Now, more than ever, I have to believe in these global goals and our ability to achieve them. That’s the world I want to leave for my daughter. Join our community of people committed to creating lasting solutions to poverty, hunger, and social injustice. 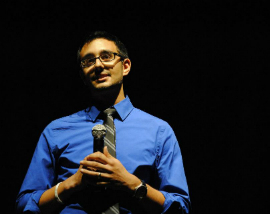 The editor of Oxfam America’s website, John Abdulla is also an independent filmmaker and blogger who believes deeply in the power of communication to inspire positive change in the world. Learn how you can help people help themselves in the fight against poverty, hunger, and injustice.